Being a single mother means having an incredibly busy life and it’s easy to forget that our children live in a world full of fun and color where our love is the most important thing they have. Sure they know we love them and there’s no doubt in our minds that we do but I think it’s important to take some time out of every day to actively remind them. And since the big world their little heads live in is full of creativity, why not remind them in a creative way? Saying I love you every morning as I send them off to school and every night as I tuck them in started to feel very monotonous and I really wanted to find some fun little ways to remind my kids that I love them that would make them smile and stick with them the whole day. Well here are my tried and true to intent ways. Have fun with these and add some of your own creativity! Start every morning with a bear hug. I’m sure a lot of us hug our children in the morning but I’m talking about a full armed, squeezing the air out of them bear hug til their laughing. I don’t do this every morning because I like for it to be a surprise. When I wake them up in the morning, before they can even get out of bed I hug them like crazy til they are laughing. They love this and the rest of the morning is full of smiles! If you have two or more kids, wake one up with a bear hug and then tag team the next kid. 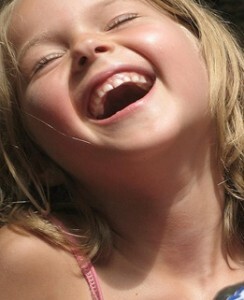 Laughter is the best way for a kid to wake up. Color their school lunch. I love tapping into my artistic side when it comes to my kid’s lunches. I have a bunch of colorful waterproof markers and I love to draw hearts, stars, moons and anything else they love. Color on their bananas or plastic wrappers. Sometimes I even put a kid friendly love note in with their lunches telling them that I love them and that I can’t wait to see them after school. If you want to take it a step further, turn it into a game. Draw an object on one of their lunch items and include a note telling them to find this item and bring it home for a prize. It’s a treasure hunt! Ask about their feelings. This is one of my favorites because showing you care about how your child feels encourages confidence and emotional intelligence. This is a chance to teach your child to pay attention to how they feel and can really set a path for good emotional health. So, what I do is when my kids get home from school, I ask them to give me one example of a situation that made them feel happy, one that made them feel good about themselves and one that made them feel excited. I don’t ever ask about anything that made them feel sad or a negative emotion because I want to put emphasis on the good feelings but if they want to tell me about something that made them sad, I let them and I listen with patience. Then I ask them to tell me how they would like to feel about that certain situation and what they think would make them feel how they want to feel. This way you’re showing them how to take a negative emotion and turn it into a positive one. Make dinner family time. In my house, the kids usually eat meals at the island at different times while I take advantage of the time to get some simple house chores done. But when it comes to dinner, I don’t care what else is going on, I make this family time. The kids help me make dinner, set the table and we actually eat together at the table. You don’t have to do this for every meal of the day but making one meal out of the day a family effort makes you feel even more like a “family”. My kids love helping in the kitchen because it makes them feel important and they’re always full of stories to tell me while we’re eating. If you want to make it even more fun, have the kids help you decide what to make although unless you give them some direction such as choose a vegetable for tonight, you might end up eating Oreo cookie pizza and strawberry milk (yes my kids actually ate pizza with crushed Oreos on it). Ask them what makes them feel loved. It’s as simple as asking sometimes. I will ask my kids to tell me one thing that I do that makes them feel loved. My son always says when I hug him and my daughter usually gives an answer such as making her cookies or curling her hair. I’ll take at least one day and I’ll do what they told me as a way to show them that I care about how they feel and that this is important to me. This one is probably the one that has awarded me the most smiles. There are so many ways to remind our children that we love them. Do you have any ideas you’d like to share with the rest of us moms? Comment below.